Prada is an approximately 2-3 year old black female who is part of a cruelty surrender of 8 from west Texas on September 21, 2016. Prada is carrying puppies, and her medical tests as well as her pregnancy are being evaluated at this time. A foster home search is currently underway. Prada passed an initial cat test and is living in a home with cats. Prada was carrying 10 puppies, none of which survived due to her malnutrition and her positive titer to Ehrlichia Canis. Surgery was performed by Dr. Jeff Ellis of VCA Preston Park Animal Hospital, and Prada is expected to make a slow recovery at this time. Once she gains her strength, treatment for the Ehrlichia Canis will begin. Prada has made a slow recovery from her surgery, and treatment for her positive titer to Ehrlichia Canis has started. She continues to be treated for her intestinal parasites. Prada has completed her treatment for Ehrlichia and has a negative PCR (Polymerase Chain Reaction) test. She has also completed all of her medical procedures. She's ready just in time for Christmas! The special medical treatment cost needed by Prada is why the Miss Mesa Fund was established. If you would like to help with Prada's care, please take a moment to make a donation to the fund. 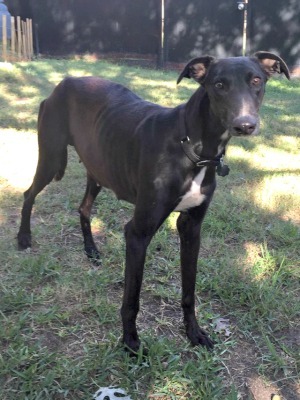 You WILL and CAN make a difference in Prada's life and the lives of other greyhounds in need of special medical care. Your help and support will make a difference - one greyhound at a time. Please note Miss Mesa Fund/Prada on your check.